The refurbished Hitachi EUP-R54AW-33 transducer is a transrectal probe and runs on the Hitachi Noblus and Hitachi Preirus ultrasound machines. It has an operating frequency range of 5 to 10 MHz, a scan angle of 360° FOV and 330 mm insertion depth. 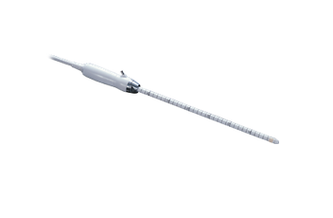 This probe is used for urology applications. Providian Medical has a wide-range of refurbished ultrasound transducers that you can choose from. For information on what is available in our inventory you may call us at 877-661-8224 or use the contact form below. I want a free price quote on the Hitachi EUP-R54AW-33, send it today!